Finishers of the 10th running of MedStar National Rehabilitation Hospital’s (NRH) Super H 5k had more than one reason to celebrate on Sunday. Their participation and fundraising contributions will benefit MedStar NRH’s community-based athletic programs for disabled adults and children. The race kicked off at 8 a.m. outside of Tysons Sport & Health in McLean, Va. in perfect low-60 degree temperatures. Winding around Tysons Corner, the course eventually looped onto a rolling route 684 and finished back in front of the sports complex. Wade Harris of Herndon captured first place after out-clipping second-place finisher and early-race leader Ted Poulos of McLean in a sprint-to-the-finish. Harris steadily reined in Poulos over the final stretch, finishing in 19:36. Andrea Meuser, who hails from Germany and resides in Vienna, easily won first in the women’s division and finished eighth overall in 20:59. A 2:59-marathoner and 2014 Boston Marathon qualifier, Meuser bided her time behind the early leader – who had two dogs in tow – before she dropped the hammer at the mile marker. But for Meuser, the ultimate prize was supporting her son Alex, who participates in MedStar NRH’s community programs and competed in the race’s wheelchair division. Making it a real family affair, Alex’s dad, Thomas, ran as a member of the race’s corporate sponsor, Volkswagen Group of the America, which is headquartered in Herndon. Thomas was one of several Volkswagen employees who came out to benefit the cause. Carsten Krebs, a communications specialist at Volkswagen, estimated that more than 100 Volkswagen workers – a whopping 20 percent of the company – participated in or raised money for the race. “It’s a great thing to do for charity, and it’s also a great way to engage employees,” he said. MedStar NRH employees also turned out with enthusiasm. Catholic University senior and MedStar NRH intern, Kaitlin Ekert convinced her boyfriend Ryan Michael to run the road race. “It’s a great way to come out and advocate for people with disabilities,” Ekert remarked of her first 5k. Despite finding the hills “challenging,” she and Michael are both eager to train for and compete in more. The real stars of the day were MedStar NRH’s program participants, who completed the course in wheelchairs and hand cycles, and with prosthetic limbs. They navigated the difficult course while onlookers and fellow racers cheered them on. “It’s amazing to watch them get up those hills,” said Walter Beckwith of West Palm Beach, Florida. Beckwith ran as part of the unofficial “Team Dave,” a group supporting a friend Dave Cohen, who finished the wheelchair race in 48:02. Despite having after completed the Bug Eye Triathlon in Cambridge, Maryland just one day prior, Beckwith was encouraged by “the great weather and the great cause” and finished in a respectable 24:48. Dana Crisan, vice president and chief philanthropy officer of MedStar Health and one of the race’s lead organizers, recruited her daughter Killian to come out and support the cause. The pair sported matching pink tops and said they were motivated by the disabled participants and spectators’ cheering. Both hope this will be just the first of many road races together. For others, the race offered an opportunity to celebrate their own health. 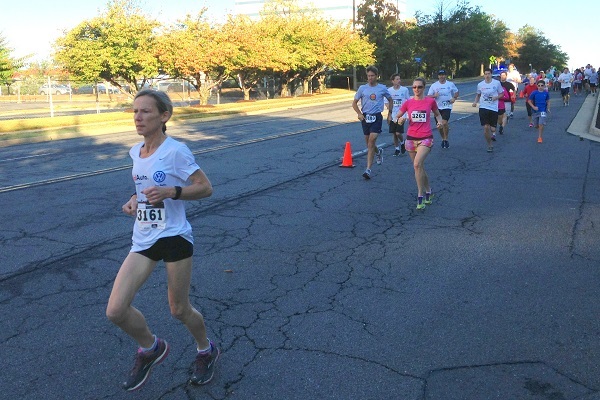 MedStar NRH physical therapist, Katie Bryson of Arlington ran to support her patients, and also felt fortunate to be able to compete pain-free. As collegiate field hockey player at Misericordia University, Bryson developed serious back problems, which doctors said could have caused paralysis. She kicked it in the final stretch to finish in 29:01. “I didn’t stop to walk once,” she said.